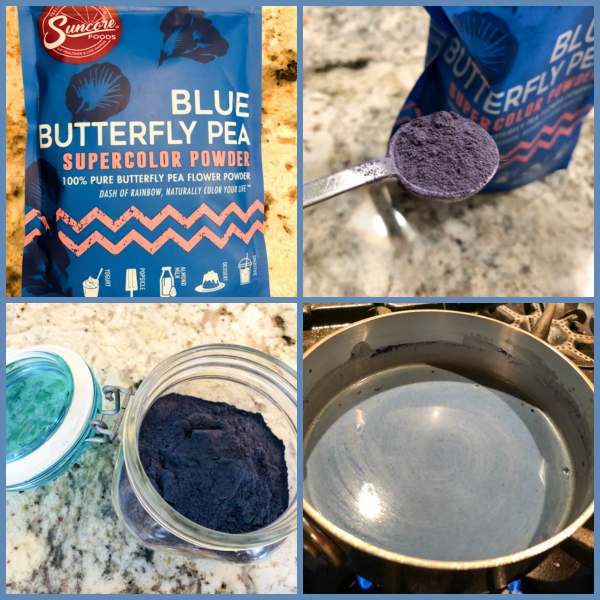 Have you heard of butterfly pea flower? Apparently it is a big thing now, or at least I see it everywhere, popping up in all kinds of preparations. It is a beautiful little flower, with an intense blue color, common in Thailand and Vietnam. You can use the flowers of the Clitoria ternatea plant (yes, that is the scientific name) to brew a beautiful tea, or you can also get it in powder form. The color changes according to the pH, so if you add lemon juice it will be pinkish purple, whereas baking soda gives a deeper blue. Of course, the possibilities are endless to explore this ingredient. I’ve seen it used in breads (even croissants! ), in cocktails and buttercreams, but today I share with you a very simple way to enjoy it, which I first saw in Lindsay’s blog, Love and Olive Oil. 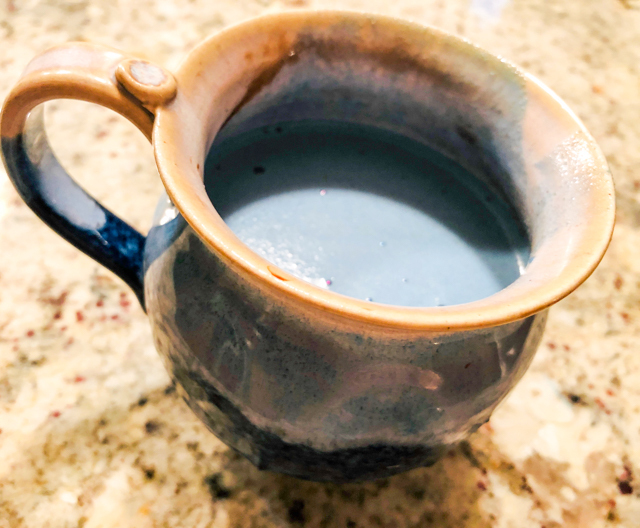 In a small saucepan set over medium-low heat, whisk together milk with honey, butterfly pea powder, and spices until powder is dissolved and milk is warm but not yet simmering. 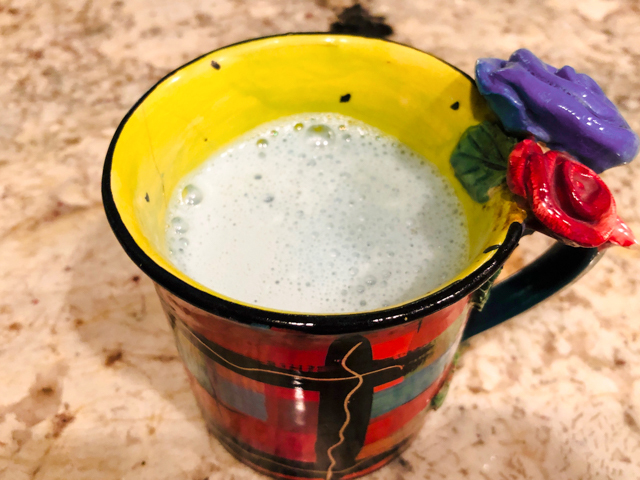 Whisk to create a fine froth using either a wire whisk, a milk-frother, or an immersion blender. Comments: For this preparation, I think the powder is a must, as it is very concentrated and you don’t really need to boil the almond milk in order to get it properly dissolved. Another thing to keep in mind is that different brands of the butterfly pea powder have different strengths, mine is definitely stronger than Lindsay’s. I am now using 1/4 tsp of the powder for 1 cup of almond milk, and like the flavor better. It is hard to describe it, actually. Earthy, maybe? Along the lines of green tea but less sharp. I also liked it very much with cardamon instead of nutmeg. Below is a picture of a version with reduced amount of powder (1/4 tsp instead of 1 full tsp). Some say this beverage helps combat insomnia. I am an excellent subject to test the hypothesis, and I can tell you it failed big time to have any positive effect. 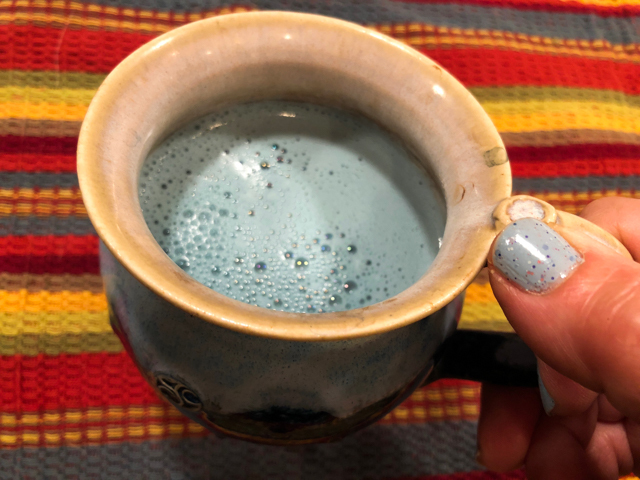 But I like the flavor, the color, and the soothing atmosphere that holding the cup with the hot, light blue liquid provides. Of course, I intend to play with it in the near future. Macarons? You’d think? FIVE YEARS AGO: Sweet Fifteen!